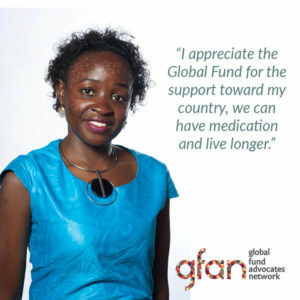 GFAN Speakers are advocates and volunteers who take time out of their extremely busy schedules to speak with people around the world about the importance of the Global Fund. This week, GFAN Speaker Resty Nalwanga shares with us the work she does with young mothers in Kampala, Uganda and why the Global Fund is important to her. Resty’s childhood had her shuffled around frequently between relatives as she struggled to be healthy. She contracted TB twice and was diagnosed with HIV when she was a teenager. During her illness, Resty started volunteering at local health centres and became involved in youth HIV advocacy work. When Resty was younger her guardians did not provide appropriate treatment, including giving her herbal remedies, which impacted her recovery and caused her first treatment to fail. In one of her recent workshops held in Bwaise, Kampalawith teen mothers living with HIV, the young women shared their stories and struggles with TB and HIV. The women in the workshop spoke of the many barriers that may impede young, pregnant HIV positive women seeking treatment including, the fact they are dependents and may have to ask for permission to go for services, midwives may refuse to attend to their births due to their fear of the virus, lack of money or support from family, lack of transportation to the clinic, and in the case of TB specifically, fear they might be blamed for bringing the disease to the family. The reality that both stigma and discrimination are impacting access to health care for these young women, and also shows a critical gap in health care. It speaks to the challenges that still remain if we hope to end the epidemics of AIDs, TB and Malaria. One young woman at the workshop shared the details of her story and why she did not access treatment right away. She had to leave school because she could no longer afford the fees, and contracted TB while working at a casino. She failed to seek treatment right away, as she had also taken up smoking, and she needed the money. After several months her condition deteriorated, and she could no longer work. She was forced to go to a doctor where she was diagnosed with TB, a disease she had never even heard of. Following her diagnosis, she lost her job, found out she was pregnant and was also diagnosed as HIV positive. She reached out to Resty’s organization, Tendo’s World as she did not know where to turn and wanted to kill herself. We can see from this young woman’s story, how critical additional supports are for accessing and understanding health care and one’s health care needs. It can be a matter of life and death. A holistic set of supports that puts patients rights front and centre is key to global goals of getting back on track and eliminating AIDS, Malaria and TB. 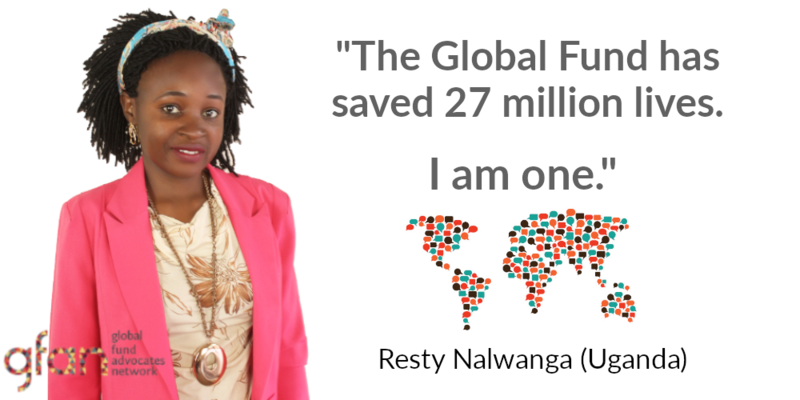 Resty is clear on the importance of the support of the Global Fund to her and to her community.